In an earlier post, I mused about Presidents and their dogs. And I was and still am somewhat concerned about the sitting President not having a dog. When the current occupant of the White House, Donald Trump, has probably little acumen on the niceties of politics or diplomacy, it is probably helpful that he does not have a dog. On the eve of President Trump’s official visit to the Arab world, I can imagine the deference Democratic politicians show other nation’s royals will be wholly or in large part absent from this President. 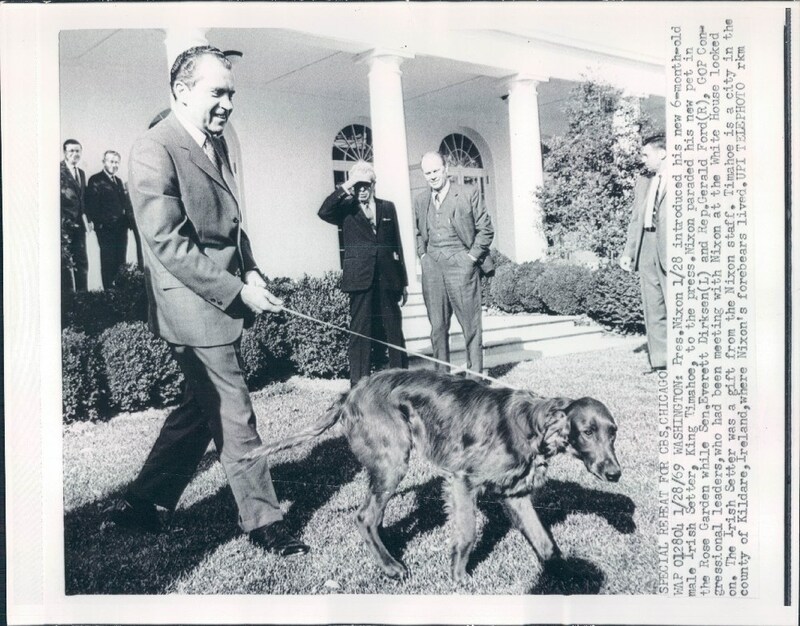 It is funny to think that President Nixon was concerned enough about the future British monarch’s sensibilities that he directed, in writing, to White House staff on how to address the president’s Irish Setter, during a visit by Prince Charles. Of course, were there a Presidential dog, I would hope that canine would avoid marketing as a brand, “Trump the Great”-Dane, or Trump the Great – Pyrenees, or perhaps King Trump (Charles Spaniel). While some of my older friends have bitter memories regarding first Senator then President, Nixon, and controversies in his tenure, in light of all the scandals, misdeeds and questionable deeds of many recent politicians of either political stripe, even a dog like my Dexter could make them look better. So if I had my choice of political leaders at all levels. from the city councilman to governor to President, I think an idea of what sort of dog-person they are should help determine whether they earn my vote.